The Office of the Special Prosecutor in Iceland has now brought charges in the so-called al-Thani case. In September 2008 Kaupthing announced that a Qatar investor, Mohamed bin Khalifa al-Thani, had bought just over 5% of share in Kaupthing. It later turned out that al-Thani wasn’t risking his own money but Kaupthing’s fund: the bank lent him money to buy the shares. A familiar pattern but this was an important statement because it made the bank seem like a good investment. The interesting thing is that according to documents from Kaupthing Deutsche Bank was involved in the al-Thani investment scheme. Those charged now are the bank’s CEO Hreidar Mar Sigurdsson, Chairman Sigurdur Einarsson, Kaupthing Luxembourg manager Magnus Gudmundsson and the second largest shareholder in Kaupthing Olafur Olafsson. They are all charged with market manipulation. Sigurdsson and Einarsson are seen as the organisers and are in addition charged with breach of fiduciary duty. Olafsson and Gudmundsson are charged for participation in this breach and Olafsson is in addition charged for money laundering. The charges are not public yet. Those four now charged are all living abroad. Olafsson has sent out a statement denying the charges. Sigurdsson says he is disappointed and holds on to the official story from September 2008: the sale was genuine and the sheikh did indeed risk his money. *A blog on the al-Thani case will be coming here soon. Here are earlier blogs referring to the al-Thani case. – The OSP writ can be read here, only in Icelandic. Will special counsel Mueller surprise with Icelandic Russia-related stories? The Russian Icelandic connections keep stimulating the fantasy. In a recent Bloomberg article Timothy L. O’Brien calls on special counsel Robert Mueller to “check out Iceland.” The facts are indeed elusive but Mueller and his team should be in an ace position to discover whatever there is to discover, via FL Group. If there is no story untold re Russia and Iceland, the unwillingness of the British government to challenge Russian interests is another intriguing Russia-related topic to explore. “Iceland, Russia and Bayrock – some facts, less fiction” was my recent contribution to the fast growing compendium of articles on potential or alleged connections between nefarious Russian forces and Iceland. The recent Bloomberg article by Timothy L. O’Brien adds nothing new to the topic in terms of tangible facts. The Russian oligarch Boris Berezovsky was one of those who early on aired the potential connection. Already in 2009, in a Sky interview that O’Brien mentions, Berezovsky made sweeping comments but gave no concrete evidence, as can be heard here in the seven minutes long interview. What however Berezovsky says regarding London, the dirty money pouring into London is correct. That flow has been going on for a long time and will no doubt continue: it doesn’t seem to matter who is in power in Britain, the door to Russian money and dirty inflow in general is always open, serviced by the big banks and the enablers, such as accountants and lawyers, operating in London. This is very much Berezovsky but hardly a clear exposé. Exactly what the connection was, through the banks or the country as a whole isn’t clear. Sadly, Berezovsky died in 2013, under what some see as mysterious circumstances, others consider it a suicide. Incidentally, Berezovsky’s death is one of fourteen deaths in the UK involving Russians, enablers to Russian oligarchs or others with some Russian ties, recently investigated in four articles by Buzzfeed. In his Bloomberg article O’Brien visits the topic of the funding of the Icelandic banks. As I mentioned in my previous Russia blog, the rumours regarding the Russian Icelandic connections and the funding of the Icelandic banks were put to rest with the report of the Special Investigative Commission, SIC. The report analysed the funding the banks sought on international markets, from big banks that then turned into creditors when the banks failed. I’m not sure where the misunderstanding crept in but of course the Icelandic central bank was not funding the Icelandic banks. As the SIC report clearly showed, the Icelandic banks, as most other banks, sought and found easy funding by issuing bonds abroad at the time when markets were flooded by cheap money. Prosecutor Ólafur Hauksson, who has been in charge of the nine-year banking investigations in Iceland, says to O’Brien that he and his team have not seen any evidence of money laundering but adds that the Icelandic investigations have not focused on international money flows via the banks. As I pointed out in my earlier Russia blog, the Jody Kriss evidence, from court documents in his proceedings against Bayrock, the company connected to president Donald Trump, is again inconclusive. Something that Kriss himself points out; Kriss is quoting rumours and has nothing more to add to them. Why and how would money have been laundered through Icelandic banks? The main purpose of money laundering is to provide illicit money with licit origin. Money laundering in big banks like HSBC, Deutsche Bank and Wachovia is well documented and in general, patterns of money laundering are well established. The Russian Icelandic story will not be any better by repeating the scanty indications. We could turn the story around and ask: if the banks were really used by Russians or any other organized crime how would they have done it? One pattern is so-called back-to-back loans, i.e. illicit money is deposited in a bank (which then ignores “know your customer” regulation) but taken out as a loan issued by that bank. That gives these funds a legitimate origin; they are now a loan. As far as I understand, there are no sign of this pattern in any of the Icelandic banks. When Wachovia laundered money for Mexican drug lords cash was deposited with forex exchanges, doing business with Wachovia. The bank brought the funds to Wachovia branches in the US, either via wire transfers, travellers’ cheques or as part of the bank’s cash-moving operations. When the funds were then made available to the drug lords again in Mexico, it seemed as if the money was coming from the US, enough to give the illegitimate funds a legitimate sheen. Nothing like these operations was part of what the Icelandic banks were doing. Money laundering outside the banks? There might of course have been other ways of laundering money but again the question is from where to where. As I mentioned in my Russia blog, FL Group, the company connected to the Bayrock story, was short-lived but attracted and lost a spectacular amount of money. As did other Icelandic companies, which have since failed: there could be potential patterns of money laundering there though again there are no Russians in sight (except for Bayrock) – or simply examples of disastrously bad management. Russians, or anyone else, certainly would not need Icelandic banks to move funds for example into the UK – the big banks were willing to and able to do it, as can be seen from the oligarchs and others with shady funds buying property in London. It was eye-opening to join one of the London tours organised by Kleptocracy Tours and see the various spectacular properties owned by Russian oligarchs here in London. The Magnitsky Act was introduced in the US in 2012 but is only finding its way into UK law this year in the Criminal Finances Bill, meant to enable asset freezing and denying visa to foreign officials known to be corrupt and having violated human rights. There were indeed real connections to Russians in the Icelandic banks as I listed in my previous Russia blog. In addition, Kaupthing financed the super yacht Serene for Yuri Shefler with a loan of €79.5m according to a leaked overview of Kauthing lending, from September 2008. These customers were among Kaupthing non-Russian high-flying London customers, mostly clients in Kaupthing Luxembourg, such as Alshair Fiyaz, Simon Halabi, Mike Ashley and Robert and Vincent Tchenguiz. None of the tangible evidence corroborates the story of the Icelandic banks being some gigantic Russian money laundering machine. That said, I have heard from investigators who claim they are about to unearth more material. In the meantime we should not forget that Iceland has diligently been prosecuting bankers for financial assistance, breach of fiduciary duty and market manipulation – almost thirty bankers and others close to the banks have been sentenced to prison. Now that 2008 investigations are drawing to a close in Iceland, four Barclays bankers are facing charges in London, the first SFO case related to events in 2008, in a case very similar to one of the Icelandic cases, as I have pointed out earlier. Exactly because the Icelandic banks have been so thoroughly investigated and so much is known about them, their clients etc., it is difficult to imagine there are humongous stories there waiting to be told. But perhaps Robert Mueller and his team will surprise us. In a formal signing ceremony 16 January 2003 a group of Icelandic investors and the German bank Hauck & Aufhäuser purchased shares in a publicly-owned Icelandic bank. Paul Gatti represented the German bank, proudly airing the intension of being a long-term owner together with the Icelandic businessman Ólafur Ólafsson. What neither Gatti nor Ólafsson mentioned was that earlier that same day, at a meeting abroad, their representatives had signed a secret contract guaranteeing that the Icelandic bank Kaupthing, called ‘puffin’ in their emails, would finance the H&A purchase in Búnaðarbanki. A large share of the profit, 57,5 million USD, would accrue to Ólafsson via an offshore company, whereas 46,5 million USD was transferred to the offshore company Dekhill Advisors Limited, whose real owners remain unknown. Thus, Ólafsson and the H&A bankers fooled Icelandic authorities with the diligent help of advisors from Société General. – This 14 year old saga has surfaced now thanks to the Panama Papers. What emerges is a story of deception similar to the famous al Thani story, which incidentally sent Ólafsson and some of the Kaupthing managers involved in the ‘puffin plot’ to prison in 2015. Ólafsson is however still a wealthy businessman in Iceland. The privatisation of the banking sector in Iceland started in 1998. By 2002 when the government announced it was ready to sell 45.8% in Búnaðarbanki, the agrarian bank, it announced that foreign investors would be a plus. When Ólafur Ólafsson, already a well-known businessman, had gathered a group of Icelandic investors, he informed the authorities that his group would include the a foreign investor. At first, it seemed the French bank Société General would be a co-investor but that changed last minute. Instead of the large French bank came a small German bank no one had heard of, Hauck & Aufhäuser, represented by Peter Gatti, then a managing partner at H&A. But the ink of the purchase agreement had hardly dried when it was rumoured that H&A was only a front for Ólafsson. Thirteen years later, a report by Reykjavík District judge Kjartan Björgvinsson, published in Iceland this week, confirms the rumours but the deception ran much deeper: through hidden agreements Ólafsson got his share in Búnaðarbanki more or less paid for by Kaupthing. Together with Kaupthing managers, two Société General advisers, an offshore expert in Luxembourg, Gatti and H&A legal adviser Martin Zeil, later a prominent FDP politician in Bayern, Ólafsson spun a web of lies and deceit. A few months after H&A pretended to buy into Búnaðarbanki the hidden agreements made an even greater sense when tiny Kaupthing bought the much larger Búnaðarbanki. Until Kaupthing collapsed in 2008 Ólafsson was Kaupthing’s second largest shareholder and, it can be argued, Kaupthing’s hidden mastermind. The H&A deceit turned out to be only an exercise for a much more spectacular market manipulation. In the feverish atmosphere of September 2008, Ólafsson, following a similar pattern as in 2003, got a Qatari sheikh to borrow money from Kaupthing and pretend he bought 5.1% in Kaupthing as a proof of Kaupthing’s strength. Ólafsson was charged with market manipulation in 2015 and sentenced to 4 ½ years in prison, together with Kaupthing managers Sigurður Einarsson, Hreiðar Már Sigurðsson and Magnús Guðmundsson, all partners in Ólafsson’s H&A deceit. 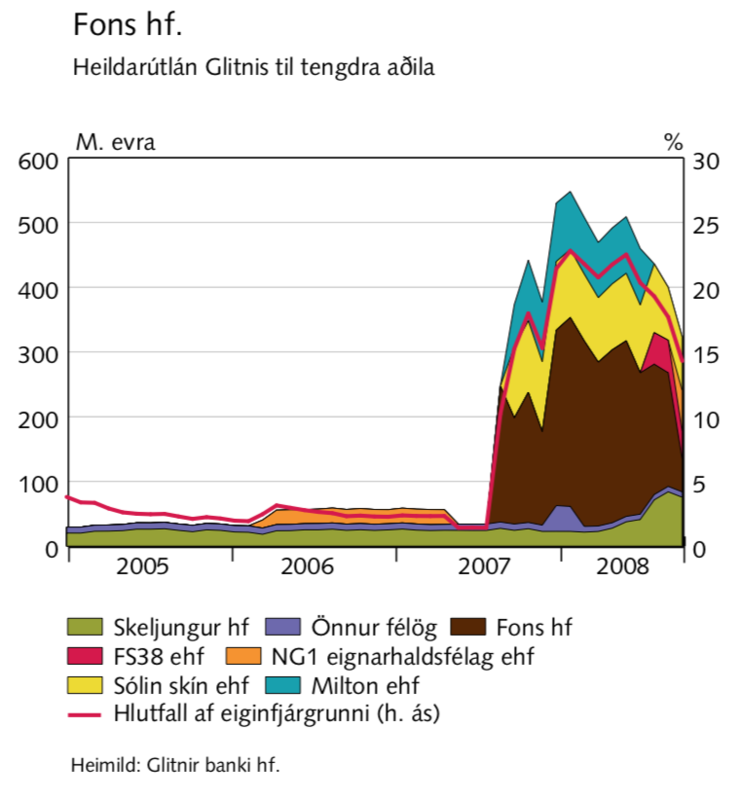 Two SocGen bankers, Michael Sautter and Ralf Darpe, worked closely with Ólafsson from autumn 2002 to prepare buying the 45.8% of Búnaðarbanki the Icelandic government intended to sell. Ólafsson gave the impression that SocGen would be the foreign co-investor with his holding company, Egla. Sautter, who had worked on bank privatisation in Israel and Greece, said in an interview with the Icelandic Morgunblaðið in September 2002 that strong core investors were better than a spread ownership, which was being discussed prior to the privatisation. In hindsight it’s easy to guess that the appearances of Ólafsson’s advisers were part of his orchestrated plot. But something did not work out with SocGen: by mid December 2002 the bank withdrew from the joint venture with Ólafsson who asked for an extended deadline from the authorities to come up with new foreign co-investors. The SocGen bankers now offered to assist in finding a foreign investor and that’s how Ólafsson got introduced to H&A, Peter Gatti and Martin Zeil. The privately held H&A came into being in 1998 when two private Frankfurt banks merged: 70% was owned by wealthy individuals, the rest held by BayernLB and two insurance companies. Until last moment Ólafsson withheld who the foreign investor would be but assuring the authorities there would be one. And lo and behold, Peter Gatti showed up at the signing ceremony 16 January 2003, held in the afternoon in an old and elegant building in Reykjavík, formerly a public library. H&A bought the shares in Búnaðarbanki through Egla, Ólafsson’s holding company, which also meant that Ólafsson was in full control of the Búnaðarbanki shares. The particular benefit for Búnaðarbanki never materialised but the arrangement certainly turned out to be extremely lucrative for Ólafsson and others involved. However, it wasn’t the agreement signed in Reykjavík but another one signed some hours earlier, far from Reykjavík, that did the trick. The other agreement, in two parts, signed far away from Reykjavík told a very different story than the show put on at the old library in Reykjavík. That agreement came into being following hectic preparation by Guðmundur Hjaltason, who worked for Ólafsson, Sautter and Darpe, Gatti and Zeil, an offshore expert in Luxembourg Karim van den Ende and a group of Kaupthing bankers. The Kaupthing bankers were Sigurður Einarsson, Hreiðar Már Sigurðsson, Steingrímur Kárason, Bjarki Diego and Magnús Guðmundsson who have all been convicted of various fraud and sentenced to prison, and two others, Kristín Pétursdóttir, now an investor in Reykjavík and Eggert Hilmarsson, Kaupthing’s trusted lawyer in Luxembourg. Karim Van den Ende is a well known name in Iceland from his part in various dubious Kaupthing deals through his Luxembourg firm, KV Associates. Will or can Hauck & Aufhäuser be forced by Icelandic law to declare if it acts on its own behalf or as trustee or agent of a third party? But how was the H&A investment presented at the H&A? According to Helmut Landwehr, a managing partner and board member at H&A at the time of the scam, who gave a statement to the Icelandic investigators the bank was never an investor in Iceland; H&A only held the shares for a client. Had there been an investment it would have needed to be approved by the H&A board. – This raises the question if Gatti said one thing in Iceland and another to his H&A colleagues, except of course for Zeil who operated with Gatti. The hidden agreement rested on offshore companies provided by van den Ende. Kaupthing set up an offshore company, Welling & Partners, that placed $35.5m, H&A’s part in the Búnaðarbanki share purchase, on an account with H&A, which then paid this sum to Icelandic authorities as a payment for its Búnaðarbanki purchase. 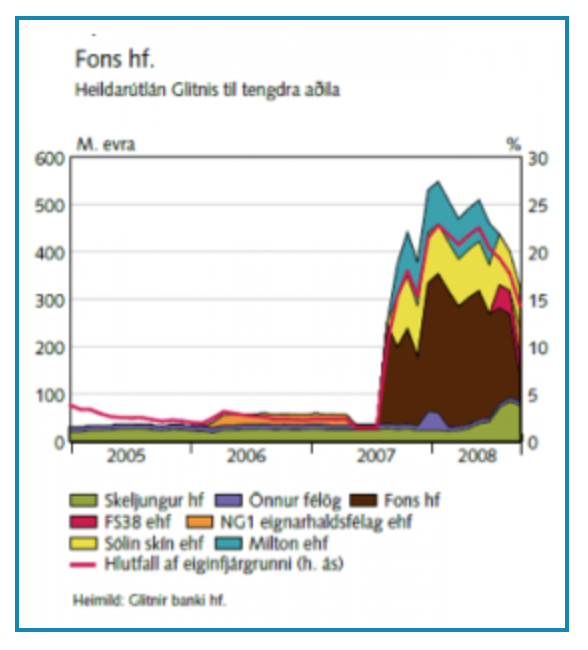 In other words, H&A didn’t actually itself finance its purchase in the Icelandic bank; it was a front for Ólafsson. H&A was paid €1m for the service. Then comes the really clever bit: H&A promised it would not sell to anyone but Welling & Partners – and it would sell its share at an agreed time for the same amount it had paid for it, $35.5m. 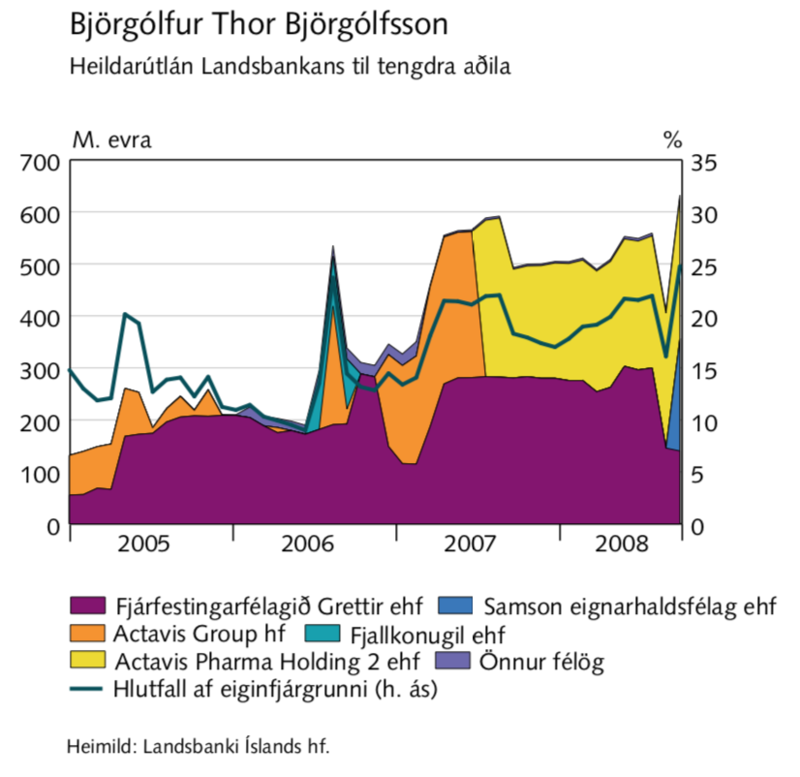 When that time came, in 2005, the H&A share in Búnaðarbanki was worth quite a bit more, $104m to be precise. Kaupthing then quietly bought the shares so as to release the profit – and here comes another interesting twist: this profit of over $100m went to two offshore companies: $57.5m to Marine Choice, owned by Ólafsson and $46.5m to a company called Dekhill Partners. Kaupthing then invested Ólafsson’s profit in various international companies. In the new report the investigator points out that the owners of Dekhill Partners are nowhere named but strong indications point to Lýður and Ágúst Guðmundsson, Kaupthing’s largest shareholders who still own businesses in the UK and Iceland. At some point in the process, which took around two years, the loans to Welling & Partners were not paid directly into Welling but channelled via other offshore companies. This is a common feature in the questionable deals in Icelandic banks, most likely done to hide from auditors and regulators big loans to companies with little or no assets to pledge. Who profited from the ‘puffin plot’? Ólafsson is born in 1957, holds a business degree from the University of Iceland and started early in business, first related to state-owned companies, most likely through family relations: his father was close to the Progressive party, the traditional agrarian party, and the coop movement. Ólafsson is known to have close ties to the Progressives and thought to be the party’s major sponsor, though mostly a hidden one. Ólafsson was also close to Kaupthing from early on and was soon the bank’s second largest shareholder. The largest was Exista, owned by the Guðmundsson brothers. There are other deals where Ólafsson has operated with foreigners who appeared as independent investors but at a closer scrutiny were only a front for Ólafsson and Kaupthing’s interests. The case that felled Ólafsson was the al Thani case: Mohammed Bin Khalifa al Thani announced in September 2008 a purchase of 5.1% in Kaupthing. The 0.1% over the 5% was important because it meant the purchase had to be flagged, made visible. To the Icelandic media Ólafsson announced the al Thani investment showed the great position and strength of Kaupthing. In 2012, when the Special Prosecutor charged Sigurður Einarsson, Magnús Guðmundsson, Hreiðar Már Sigurðsson and Ólafsson for their part in the al Thani case it turned out that al Thani’s purchase was financed by Kaupthing and the lending fraudulent. Ólafsson was charged with market manipulation and sentenced in 2015 to 4 ½ years in prison. He had only been in prison for a brief period when laws were miraculously changed, shortening the period white-collar criminals need to spend in prison. Since his movements are restricted it drew some media attention when he crashed his helicopter (he escaped unharmed) shortly after leaving prison but he is electronically tagged and can’t leave the country until the prison sentence has passed. The Guðmundsson brothers became closely connected to Kaupthing already in the late 1990s while Kaupthing was only a small private bank. 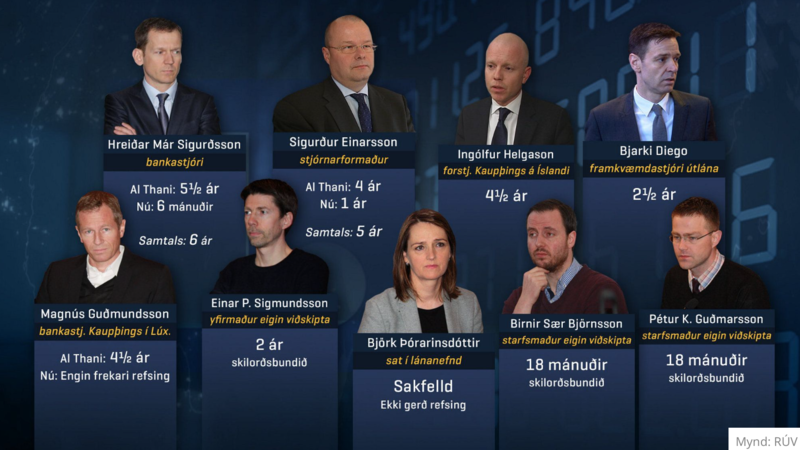 Lýður, the younger brother was in 2014 sentenced to eight month in prison, five of which were suspended, for withholding information on trades in Exista, where he and his brother were the largest shareholders. Both Ólafsson and the Guðmundsson brothers profited handsomely from their Kaupthing connections. Given Ólafsson’s role in the H&A alleged investment and later in the al Thani case it is safe to conclude that Ólafsson was a driving force in Kaupthing and could perhaps be called the bank’s mastermind. In spite of being hit by Kaupthing’s collapse Ólafsson and the brothers are still fabulously wealthy with trophy assets in various countries. This may come as a surprise but a characteristic of the Icelandic way of banking was that loans to favoured clients had very light covenants and often insufficient pledges meaning the loans couldn’t be recovered, the underlying assets were protected from administrators and the banks would carry the losses. How much this applied to Ólafsson and Guðmundsson is hard to tell but yes, this was how the Icelandic banks treated certain clients like the banks’ largest shareholders and their close collaborators. When Ólafsson was called to answer questions in the recent H&A investigation he refused to appear. After a legal challenge from the investigators and a Supreme Court ruling Ólafsson was obliged to show up. It turned out he didn’t remember very much. Ólafsson engages a pr firm to take of his image. After the publication of the new report on the H&A purchase Ólafsson issued a statement. Far from addressing the issues at stake he said neither the state nor Icelanders had lost money on the purchase. Over the last months Ólafsson has waged a campaign against individual judges who dealt with his case, an unpleasant novelty in Iceland. In spite of Gatti’s presence at the signing ceremony in January 2003 the rumours continued, even more so as H&A was never very visible and then sold its share in Búnaðarbanki/Kaupthing. One person, Vilhjálmur Bjarnason, now an Independence party MP, did more than anyone to investigate the H&A purchase and keep the questions alive. Some years later, having scrutinised the H&A annual accounts he pointed out that the bank simply couldn’t have been the owner. Much due to Bjarnason’s diligence the sale was twice investigated before 2010 by the Icelandic National Audit Office, which didn’t find anything suspicious. The investigation now has thoroughly confirmed Bjarnason’s doubts. Both in earlier investigations and the recent H&A investigation Icelandic authorities have asked the German supervisors, Bundesanstalt für Finanzdienstleistungsaufschicht, BaFin, for information, a request that has never been granted. During the present investigation the investigators requested information on the H&A ownership in 2003. The BaFin answer was that it could only give that information to its Icelandic opposite number, the Icelandic FME. When FME made the request BaFin refused just the same – a shocking lack of German willingness to assist and hugely upsetting. The BaFin seems to see its role more as a defender of German banking reputation than facilitating scrutiny of German banks. The Icelandic Special Investigative Commission, SIC, set up in December 2008 to investigate the banking collapse did investigate the H&A purchase, exposed the role played by the offshore companies but could not identify the owners of the offshore companies involved and thus could not see who really profited. The Panama leak last year exposed the beneficial owners of the offshore companies. That leak didn’t just oust the then Icelandic prime minister Sigmundur Davíð Gunnlaugsson, incidentally a leader of the Progressive party at the time but also threw up names familiar to those who had looked at the H&A purchase earlier. Last summer, the Parliament Ombudsman, Tryggvi Gunnarsson who was one of the three members of the SIC made public he had new information regarding the H&A purchase, which should be investigated. The Alþingi then appointed District judge Kjartan Björgvinsson to investigate the matter. By combining data the SIC had at its disposal and Panama documents the investigators were able to piece together the story above. However, Dekhill Partners was not connected to Mossack Fonseca where the Panama Papers originated, which means that the name of the owners isn’t found black on white. However, circumstantial evidence points at the Gudmundsson brothers. How relevant is this old saga of privatisation fourteen years ago? The ‘puffin plot’ saga is still relevant because some of the protagonists are still influential in Iceland and more importantly there is another wave of bank privatisation coming in Iceland. The Icelandic state owns Íslandsbanki, 98.2% in Landsbanki and 13% in Arion. Four foreign funds and banks – Attestor Capital, Taconic Capital, Och-Ziff and Goldman Sachs – recently bought shares in Arion, in total 29.18% of Arion. Kaupskil, the holding company replacing Kaupthing (holding the rest of Kaupthing assets, owned by Kaupthing creditors) now owns 57.9% in Arion and then there is the 13% owned by the Icelandic state. The new owners in Arion hold their shares via offshore vehicles and now Icelanders feel they are again being taken for a ride by opaque offshorised companies with unclear ownership. In its latest Statement on Iceland the IMF warned of a weak financial regulators, FME, open to political pressure, particularly worrying with the coming privatisation in mind. The Fund also warned that investors like the new investors in Arion were not the ideal long-term owners. The palpable fear in Iceland is that these new owners are a new front for Icelandic businessmen like H&A. Although that is, to my mind, a fanciful idea, it shows the level of distrust. Icelanders have however learnt there is a good reason to fear offshorised owners. The task ahead in re-privatising the Icelandic banks won’t be easy. The H&A saga shows that foreign banks can’t necessarily be trusted to give sound advice. The new owners in Arion are not ideal. The thought of again seeing Icelandic businessmen buying sizeable chunks of the Icelandic banks is unsettling, also with Ólafsson’s scam with H&A in mind. It’s no less worrying seeing Icelandic pension funds, that traditionally refrain from exerting shareholder power, joining forces with Icelandic businessmen who then fill the void left by the funds to exert power well beyond their own shareholding. Or or… it’s easy to imagine various versions of horror scenarios. In short, the nightmare scenario would be a new version of the old banking system where owners like Ólafsson and their closest collaborators rose to become not only the largest shareholders but the largest borrowers with access to covenant-light non-recoverable loans. Out of the relatively small ‘puffin plot’ Ólafsson pocketed $57.5m. The numbers rose in the coming years and so did the level of opacity. Ólafsson is still one of the wealthiest Icelanders, owning a shipping company, large property portfolio as well as some of Iceland’s finest horses. In 2008, five years after the banks were fully privatised the game was up for the Icelandic banks. The country was in a state of turmoil and it ended in tears for so many, for example the thousands of small investors who had put their savings into the shares of the banks; Kaupthing had close to 40.000 shareholders. It all ended in tears… except for the small group of large shareholders and other favoured clients that enjoyed the light-covenant loans, which sustained them, even beyond the demise of the banks that enriched them. Obs. : the text has been updated with some corrections, i.a. the state share sold in 2003 was 45.8% and not 48.8% as stated earlier. On October 6 the Supreme Court in Iceland ruled in one of the largest collapse cases so car where nine Kaupthing managers were charged for market manipulation (see an earlier Icelog). As in a similar case against Landsbanki managers the Kaupthing bankers were found guilty. The Reykjavík District Court had already ruled in the Kaupthing market manipulation case in June 2015. This is how Rúv presented the Supreme Court judgement in October. Kaupthing’s CEO Hreiðar Már Sigurðsson was sentenced to six months in prison, in addition to the 5 1/5 years in the so-called al Thani case where the bank’s executive chairman had received a four year sentence. The market manipulation case added a year to that case. Magnús Guðmundsson managing director of Kaupthing Luxembourg was found guilty but did not receive a further sentence, having been sentenced to 4 1/2 years in the al Thani case. Other sentenced in October were Ingólfur Helgason managing director of Kaupthing Iceland, 4 1/2 years and Bjarki Diego head of lending 2 1/2 years. Four employees were found guilty: three of them got suspended sentences. The fourth, Björk Þórarinsdóttir was found guilty but not sentenced. The investigations by the Office of the Special Prosecutor, now the District Prosecutor, have so far resulted in finding guilty around thirty bankers and others related to the banks. As I have often pointed out: the penal code in Iceland is mostly similar to the code in other neighbouring European countries but the difference was the will of the Prosecutor to investigate very complex cases, taking on a huge task undaunted. That’s the difference – no case was seen as being too complicated to investigate. 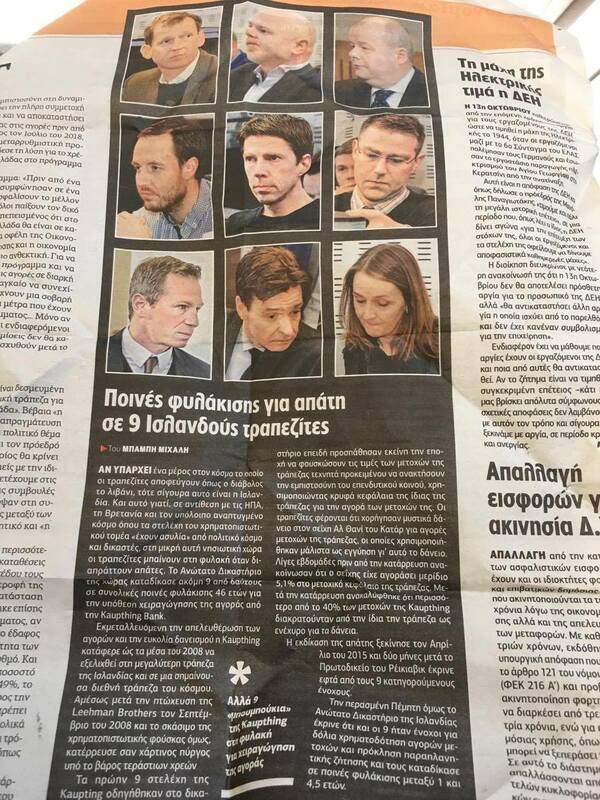 Last week, the following article was in one of the Greek papers. From the photos I can see that this article is about the above case. Something for the Greeks to ponder on: what’s done in Iceland, less in Greece.